It is important for a child to have healthy drinks in order for your child to live a healthy and productive life. While sodas and other popular drinks tend to taste good, it is very important for the parent to encourage better drinking habits in their children. Fortunately, there are many great tasting healthy drinks that children can have in place of soda. With these drinks, children are less likely to develop health problems. Your children will also feel more energetic throughout the day, which will show in various activities and his or her grades. Here are some drinks that you can consider for the health of your child. Tea is one drink that your child can have in place of soda. Tea has a lot of antioxidants that not only protect your child from illness, but they also energize your child. There are many different types of teas. You can choose from ice lemon tea, ice green tea, regular lemon tea and many other varieties. They are available in stores everywhere. There are many different companies that create these drinks. You can choose between the sweetened and the unsweetened type of tea drinks. One drink that children really need is drinking water. Water is what makes up most of the human body. Every day, the body loses water. The amount of water lost depends on the amount of activity that the child has. You lose water through sweat, breathing, etc. When the body’s water is low, the body goes through symptoms of dehydration. It is important for the child to have an adequate amount of water. Water also helps with the management of weight and the processing of nutrients. Unfortunately, if the child drinks water without replenishing other nutrients, he will go through issues like hyponatremia. Fortunately, there are drinks that are designed to replenish the body’s fluids and electrolytes. These are called isotonic drinks. They are commonly sold as sports drinks. These are said to quench thirst at a level a lot deeper than water can. Sports drinks have been created for people who live a highly active lifestyle which usually involves a lot of running and strenuous activity. When you participate in sports, you tend to lose a lot more water through sweat. When you sweat, your body sheds electrolytes along with the sweat. 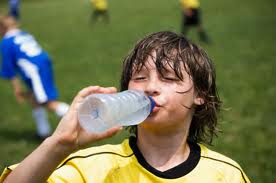 Sports drinks replace the electrolytes that are lost from the activity, leaving the child refreshed and energized. Coconut drink is also considered a great drink for children. It has a high concentration of potassium and minerals. It is also low in carbohydrates and calories. As a result, a lot of people consider this to be a natural sports drink. It is sold in an increasing number of stores. Well, you may read this healthcare article about Coconut Drinks and Other Natural Healthy Drink Alternatives. If you are looking for nutritious drinks for children, these are some of the best drinks for your children. These drinks have a lot of health benefits that will help with the child’s development. There are other drinks to consider as well. However, these are known to have some great benefits. Watch the ICT’s nutritionist Lynda Enright talks about healthy drinking options for kids.